No more bent and damaged artwork! Meets UPS and Fedex insurance standards. Fits 11 x 17" photo. Stickers not included. No more bent and damaged artwork! 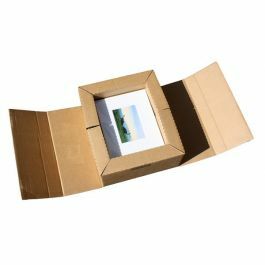 ClearBags customers have long-praised our packaging prowess and now we are offering our proprietary Airsafe™ art box design to you. ClearBags Airsafe™ art boxes meet UPS and Fedex insurance standards for a full 2" of free air space between your product and the outer wall. Boxes ship and store flat. Simply roll-up both ends and tape the box shut. Made from 200# test corrugated cardboard. Fits 11 x 17" photo.